Control your home's most demanding electrical consumers. You shouldn't be a slave to your home's 240V appliances; with Load Controller, you can add remote control to your large, power-hungry appliances. And if you add Insteon Hub, you can remotely control Load Controller from almost any smartphone or tablet. Your water heater and large window AC unit are all ripe for remote control. It doesn't matter if you just want to schedule operation with the Insteon Hub or take advantage of Works with Nest Rush Hour Rewards, Load Controller will help you reign in control of your 240V appliances. Not all 240V appliances have the same remote control needs. That's why we've developed both a Normally Open (N/O) and Normally Closed (N/C) Load Controller. Whichever type your application needs, there's a Load Controller for you. In just a few short steps, you can add remote control to almost any 240V 30A appliance in your home. Mount Load Controller near your controlled appliance with the convenient mounting wings. Grab some conduit and connect to a junction box. Wire up the black and red wires to the incoming 240V supply. Connect the two purple wires to your appliance's power leads and seal up the junction box. Load Controller is not rated for exposure to the elements and should be encased in a weather-rated outdoor enclosure if used outdoors. 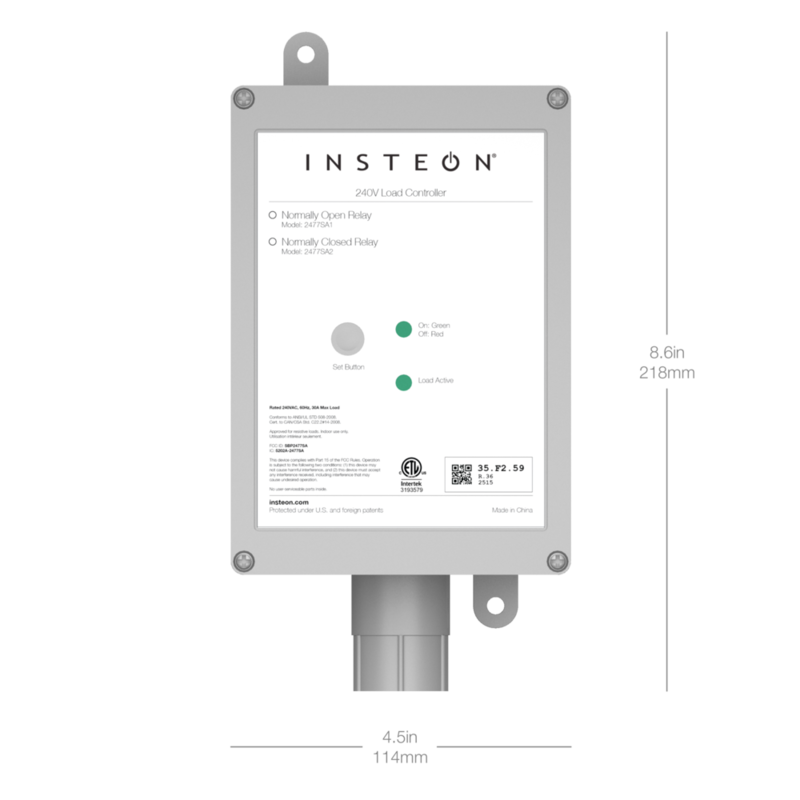 You're ready to link Load Controller to other Insteon devices for remote control. Or with just a few taps, add Load Controller to the Insteon Hub and enjoy remote control and scheduling from your smartphone. Connecting Load Controller requires working with 240V. Load Controller should only be installed by a qualified electrician or home owner with extreme familiarity with electrical wiring. Sure, your home's AC compressor might be 240V. But you've already got a thermostat to control that device. Use Load Controller to add smarts to devices like electric baseboard heaters, pool pumps and electric water heaters. Save energy by turning off your water heater when no one will be showering - like during the day while your at work or at night when you're asleep. Add an Insteon Wireless Thermostat and Load Controller and you can enjoy the convenience of climate control with your larger 240V window AC units. 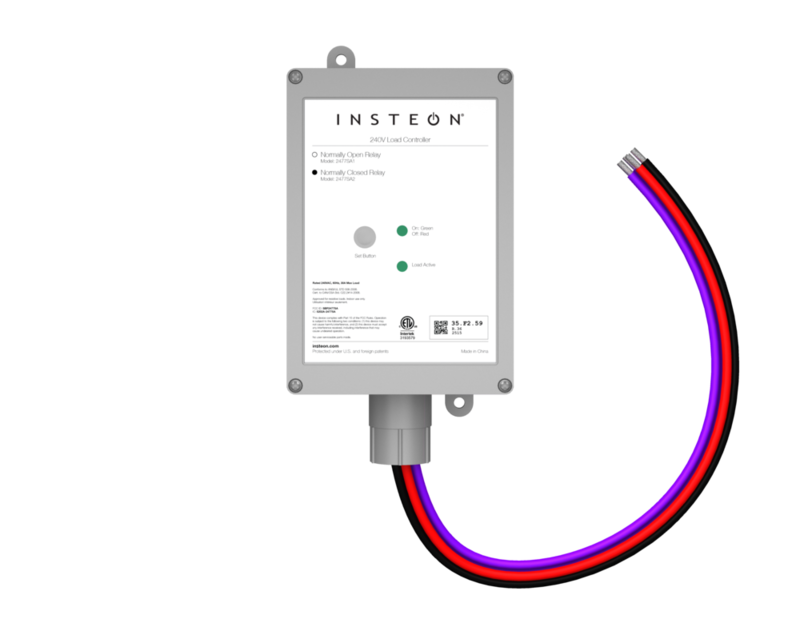 Bring your 240V baseboard heaters into the 21st century by coupling Load Controller with an Insteon Wireless Thermostat or control from your smartphone with Insteon Hub.